If the sight of all those hearts that are randomly appearing is only serving to make you realize that you are not yet ready, then here’s a little well kept secret that might help you out. Southern Unique is a store full of eclectic, unique pieces that could be just the right gift for your sweetheart. 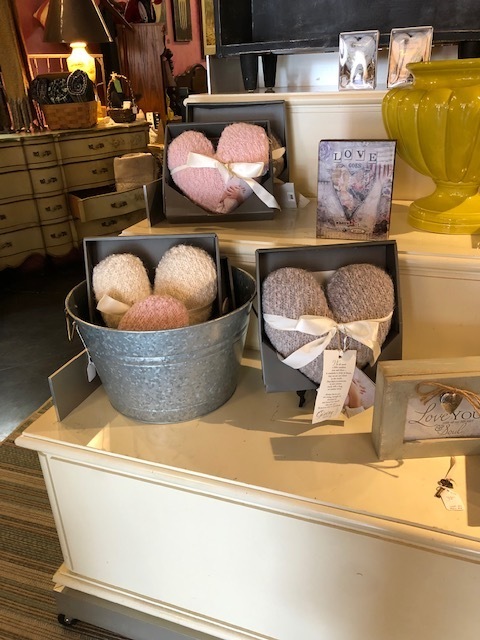 Venture in and find anything from an old fashioned tea service to leather handbags, tee-shirts to tea towels with great quotes on them, chairs (I just bagged two gorgeous leather rocking chairs that are perfect next to the fireplace), occasional tables, lamps - and, yes, there are hearts. I could go on and on but please go and take a look for yourself. The space is so lovely that it’s worth seeing just for the architecture. And, in fact, all the stores on that little stretch are architectural gems. This is the kind of place I would have expected to see in SoWa, in Bostons South End, and we have it right here in downtown Eatonton. So - NO EXCUSES! If you are looking for something that’s one-of-a-kind then get yourself down there and look no further. I guarantee you’ll find something you love. Open Wednesday 12-6 pm, Thursday - Saturday, 10 am - 6pm.